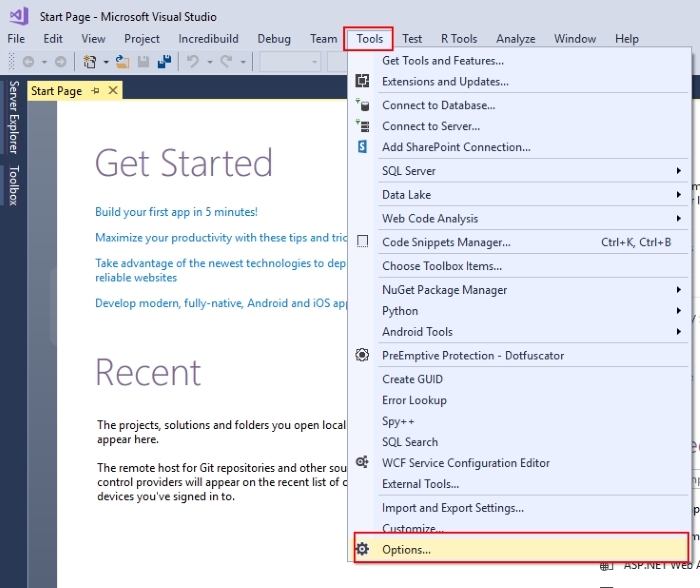 Once Visual Studio is successfully installed, launch it in order to build your first console application using C#. 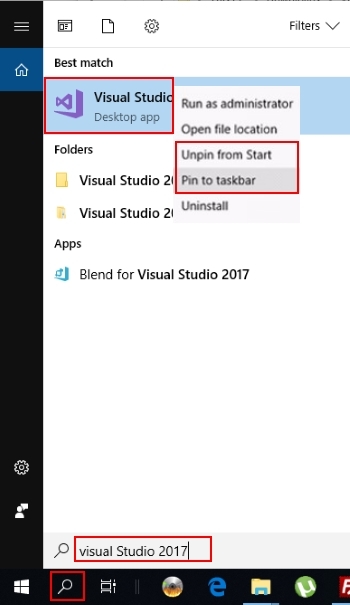 You can also do right-click and select Pin to Taskbar as a convenient way for you to launch the application from the Windows taskbar. 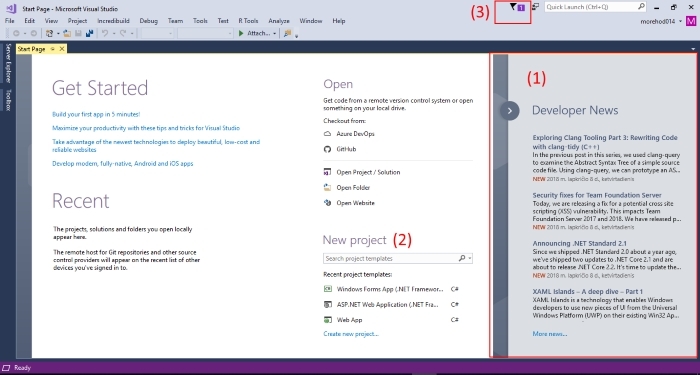 Once Visual Studio launches you will be lead to an account login prompt. This second login is for synching up settings from other installs of Visual Studio that you may have signed into previously. 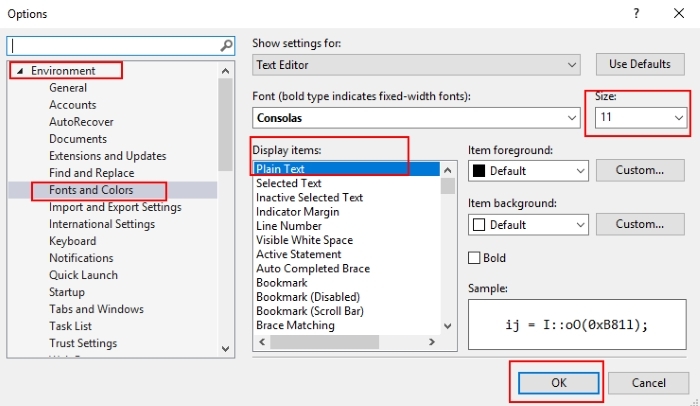 This includes settings such as fonts, colors, window placement and so on. (1) - dedicated to providing news related items or links into MSDN (Microsoft Developer Network). 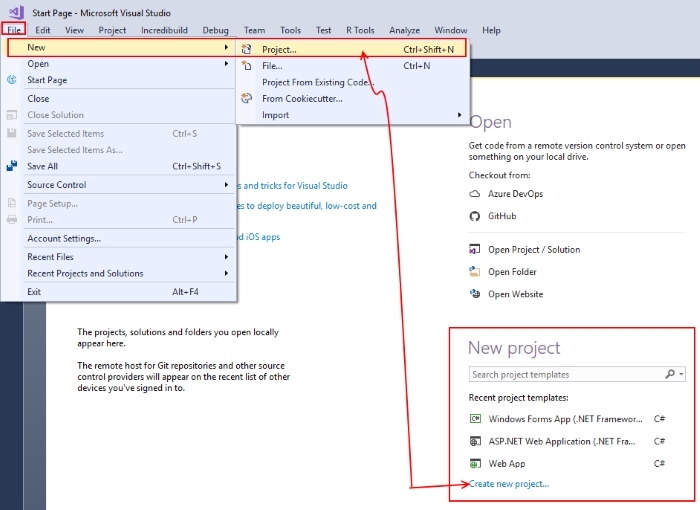 This news section features valuable resources, such as, articles and videos that can help you learn more about programming in Visual Studio and keep up to date with the latest features. (2) - convenient way to create a new project, open an existing project or access a list of recent projects, which is a list that will grow larger as we add new projects over the coming lessons. (3) - important notifications. If you click it, you will see whether or not there are any suggested updates that you should apply. 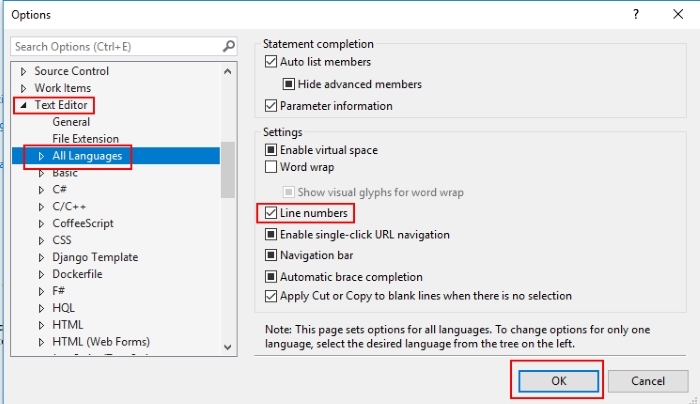 A simple adjustment to make code lines easier to follow, is to enabling line numbers for the left margin. To do so, go to the Tools -> Options. This is to enable the line numbers appearing in the left margin when programming for easy reference. You can also adjust the font size. Go to Environment -> Fonts and Colors. You will see the New Project window. Go to the Installed Templates-> Visual C# -> You can select any template (Windows Form App or Console App or ASP.NET Web Application). 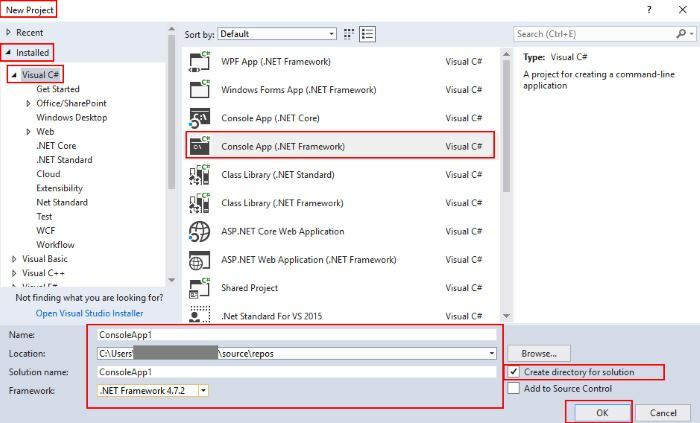 We need to select the Console App (.NET Framework), framework version (for example 4.7.2), change the name of your project to ConsoleApp1. Let's write our code which will be used to display the string "Hello World!!" in the console application. All the below code needs to be entered into the Program.cs file. The code will be used to write "Hello World!!" when the console application runs. The next line has the namespace declaration. A namespace is a collection of classes. The ConsoleApp1 namespace contains the class Program. Classes generally contain multiple methods. Methods define the behavior of the class. 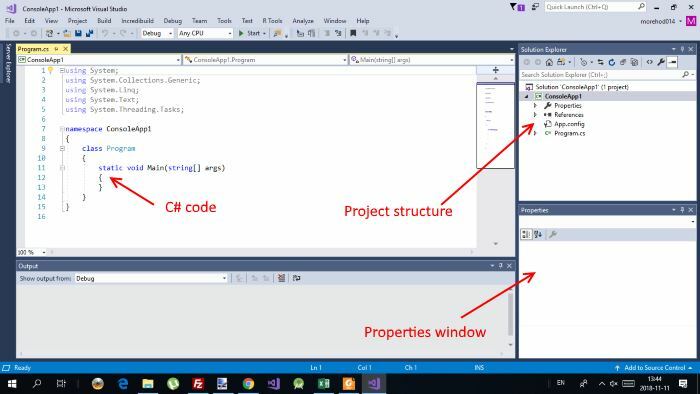 However, the Program class has only one method Main - it is the entry point for all C# programs. The Main method states what the class does when executed. WriteLine is a method of the Console class defined in the System namespace. This statement causes the message "Hello, World!!" to be displayed on the screen. The last line Console.ReadKey(); is for the VS.NET Users. This makes the program wait for any key press and it prevents the screen from running and closing quickly when the program is launched from Visual Studio .NET. The next lines // and /*...*/ are ignored by the compiler and it is put to add comments in the program. Console.WriteLine(message) or Console.Write(message). The difference is that with the Console.WriteLine(message) you go automatically to next line and with Console.Write(message) you stay on the same line. Console.ReadKey() or Console.ReadLine(). 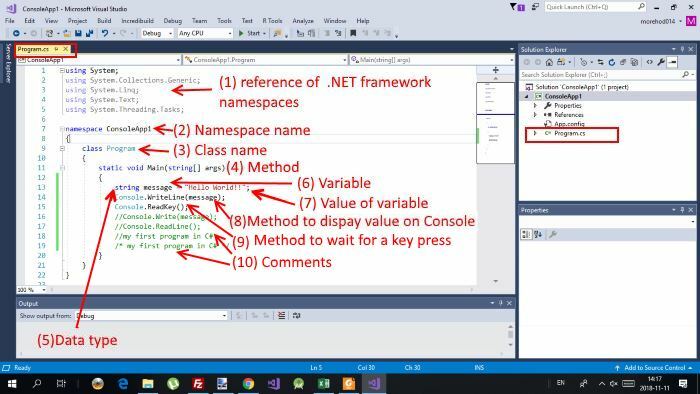 Console.ReadKey() makes the program wait for any key press and it prevents the screen from running and closing quickly when the program is launched from Visual Studio .NET. Console.ReadLine() makes the program wait for enter key press and it prevents the screen from running and closing quickly when the program is launched from Visual Studio .NET. Click the Run button or press F5 key to execute the project. A Command Prompt window appears that contains the line Hello World!!. If you did not use Console.ReadKey() or Console.ReadLine() in your program press Ctrl + F5 or select from the main menu Debug ->Start Without Debugging. The console will not close after program execution. If you press F5 or Run it will close quickly after execution. You can find compiled application named ConsoleApp1.exe in subfolder bin/Debug which is inside of your project folder saved on your PC.